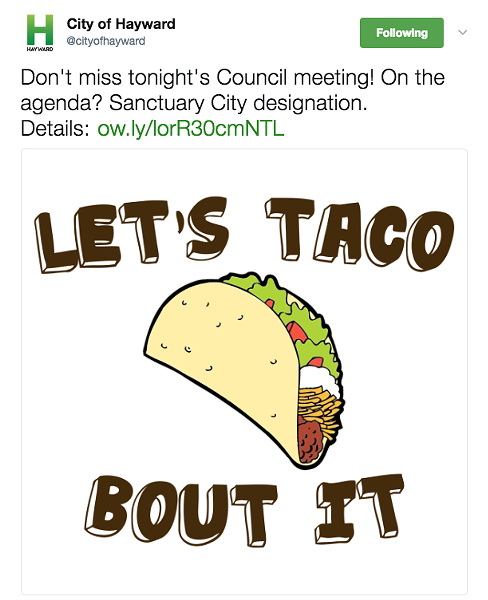 This morning, just hours before Hayward city council's scheduled discussion of whether or not to become a sanctuary city, the city's official Twitter account posted an image of a taco and the phrase "Let's Taco About It" — a Tweet that has activists accusing the city of bigotry. Two other tweets promoting different city events also included the hashtag "#TacoBoutItTuesday." Luis Reynoso, a member of Hayward's school board, said the Twitter post shows that city council is "out of control." “They have no control over what city staff is doing, when there's so much bigotry and racism in Hayward," he told the Express. For months, Reynoso has been highly critical of city council and its handling of the sanctuary-city issue, accusing officials of dragging their feet. We sincerely apologize for the inappropriate tweet about tonight's City Council meeting and potential Sanctuary City declaration. While many other East Bay governments have declared themselves sanctuary cities — or the less politically volatile designation of "compassionate city" — Hayward has been silent. This despite the fact that 40 percent of Hayward's population is Latino, including more than 60 percent of school children. "Obviously, I was offended, as a Latina and an immigrant," Denize Sanchez said of the city's Tweet. Sanchez is a member of Hayward Collective: Hella Diverse, a community group that has been working on the sanctuary city issue for months. “When we use cultural appropriations like equating a taco to Latinos, we take a few steps back. It’s a little bit disrespectful,” Sanchez told the Express. In late January, Hayward City Council resisted calls to place a sanctuary city item on its agenda, despite mounting pressure from residents. Instead, the council voted to create a 22-person task force, charged with updating Hayward’s nearly three-decades-old anti-discrimination policy. In late April, the task force recommended that Hayward become a sanctuary city. But the city administration and Mayor Barbara Halliday have consistently argued that many of policies that represent sanctuary cities, such as declining to cooperate with the U.S. Immigration and Customs Enforcement, are already in place in Hayward. City officials also express concerns that, if it becomes a sanctuary city, it could put an estimated $30 million in potential federal funding at risk. And at a council meeting in April, Halliday told a Hayward school teacher during public comment that the city could not help students fearful of President Trump’s anti-immigrant agenda. "Unfortunately, though, I can't tell you to tell them they're safe, because we are not in charge of the federal government," Halliday explained. Tonight’s agenda does not include a specific recommendation from city staff on whether or not to become a sanctuary city.